We are witnessing a dramatic global shift in attitudes towards ESG investing, as investors demand more responsible and sustainable management of their assets. The term ‘ESG investing’ refers to embedding environmental, social and governance factors alongside financial factors in the investment decision-making process. According to Kingsdale Advisors , ESG investing is estimated at over $20 trillion in AUM or around a quarter of all professionally managed assets around the world. Seen by many as the future of investing, its rapid growth is driven by several factors – including regulatory changes, demographic shifts and changing attitudes towards climate change and sustainability issues worldwide. 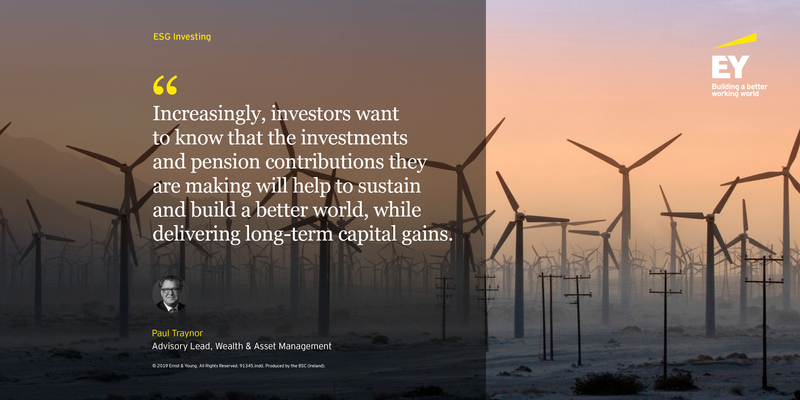 Increasingly, investors want to know that the investments and pension contributions they are making will help to sustain and build a better world, while delivering long-term capital gains. Emerging technologies, including machine learning and data analytics, are helping to unlock greater insights based on ESG data. This is leading to growing evidence and awareness of the positive impact of ESG on performance, and further fuelling investor demand. Regulation addressing ESG themes has also developed rapidly in recent years. In March 2018, the European Commission launched a strategy for reforming the EU financial system to support its climate change and sustainable development agenda. The Action Plan: Financing Sustainable Growth aims to embed sustainability considerations firmly into the mainstream of financial markets. One stream of the plan aims to facilitate greater ‘impact investing’ by public funds through better disclosures to end investors, an initiative that will be well received by an ever more conscious investing public. A package of legislative proposals was also introduced in May 2018 and, as a follow-up, the European Securities and Markets Authority (ESMA) was mandated to prepare technical advice on the integration of sustainability risks and factors in the UCITS Directive and AIFMD Directive. It aims to do this by 30 April 2019. These measures have a number of key impacts for asset managers and advisers, which include ensuring that ESG factors and risks are integrated into their legal duties to investors and/or clients, and formal disclosure obligations around how sustainability risks are integrated in their organisations and the services they provide. If you have a question about any of the above, don’t hesitate to reach out to us.